For lovers of high mountains and majestic alpine panoramas, the Val d'Anniviers in the Valaisan Alps of Switzerland is the ideal summer destination. With a collection of authentic mountain villages made up of traditional, sun blackened houses serviced by an excellent network of buses the area is both accessible and idyllic. Lying above these villages are high mountains peaks, including five 4000m plus summits at the crown of the valley. But you don't have to be a climber to have fun either, with hundreds of kilometres of well marked hiking trails that make up a hikers playground and a selection of unobtrusive cable cars and ski lifts making the most stunning vantage points accessible to everyone. The Val d'Anniviers extends south from the Rhone valley at Sierre with the winding road rising to the town of Vissoie at 1202m. Soon after Vissoie the valley splits into the Val de Moiry in the west and Zinaltal in the east. The ski resort of Zinal (1672m) rests in the more eastern arm while the resort of Grimentz (1553m) lies in the western. The two other most visited villages are St Luc (1655m) and Chandolin, one of Europe's highest villages at 1936m, which lie on the sunny southern flank of the main valley above Vissoie. We first arrived in Val d'Anniviers by chance in June 2014. We were following a suggested motorhome tour of Switzerland which actually missed out this valley in favour of a trip to Zermatt and Saas Fee but as we were searching for a free motorhome aire and one was advertised in Grimentz in our Camperstop guide we decided to give this valley a try. The climb to the aire at Grimentz was our first steep ascent in our motorhome and we arrived so stressed from that drive that we almost left immediately! But, after paying a brief visit to the tourist office to ask about hiking in the area we decided to stay for the night. 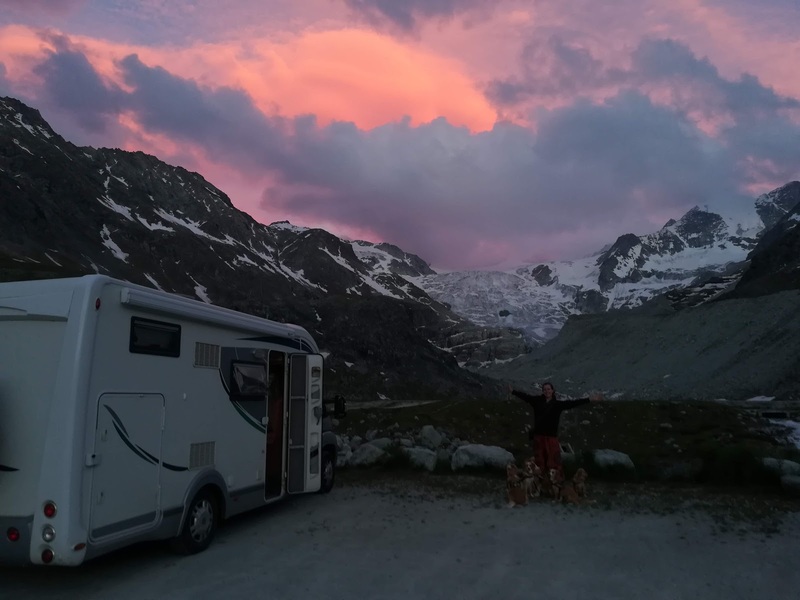 That first visit turned into 9 days and we fell so much in love with the magic of Val d'Anniviers that we returned again in September 2014 for another 16 nights, this time staying on a motorhome aire in Zinal. Trying to describe what it was that so captivated us in Val d'Anniviers is a challenging task. For us this valley offers the perfect balance between tourist accessibility blended with the natural and traditional history of the area. For example, the ancient culture of the valley is one of farming and the hills still ring to the sound of cowbells. The sun blackened villages still contain the ancient grain silos, chapels, mills and cow sheds that evidence the harsh existence forged here for centuries before the tourists arrived. Watching the festivals when the decorated cows are bought through the village streets and the annual Renne (Queen) who has produced the most milk is declared was one of our most unique experiences in the valley. But alongside this unspoiled and sensitively handled cultural heritage the modern industry of tourism blends in quite closely with the natural contours of the valley. With several major cable cars alongside dozens of ski lifts I'm not claiming they are invisible, or even pretty to look at but they seemed far less obtrusive than other more popular areas in the Swiss Alps we had visited. Perhaps this was because, importantly to us, while these lifts make some of the most amazing vantage points in the main valley such as Bendolla, Tignousa and Sorebois open to all visitors, the ends of the 2 valley arms remained natural and untouched. It is a perfect mix of accessibility and untouched wilderness. This means that for hiking and nature lovers still wanting to access the highest and most remote peaks it was still possible to get away from all of the ski lifts and most of the crowds to feel a real connection with the Alpine beauty and wilderness. For example, by catching a bus from Grimentz to the Moiry Barrage and hiking along the reservoir to Glacier de Moiry it was possible, in just half an hour, to leave the busy world completely behind. Or from Zinal you can head due south towards various cabins in the shadow of the “Grande Couronne” (Great Crown), which includes the Weisshorn, Bishorn Zinalrothorn, Obergabelhorn, Matterhorn and Dent Blanche. Then as the sun begins to set return back to civilisation and safety until the next morning. During our 25 days in Val d'Anniviers we enjoyed some of the most exhilarating and moving hiking experiences we've ever had. But the total experience was about more than just hiking, majestic views and pretty architecture. The atmosphere of the valley was unanimously friendly from the smiling bus drivers, some of whom we got to know and recognise, to the incredibly helpful tourist office staff. On one occasion a kind lady we had gotten to know in the Grimentz tourist office saw us waiting for a bus and gave us a lift to our motorhome. Just a few days before her husband, a bus driver in the valley, had rescued us from a summer hailstorm and driven us back from Moiry Barrage! The Val d'Anniviers we got to know in 2014 was a perfect mix of tradition and modernity, accessibility and wilderness, community and anonymity. We could be all alone with just the mountains and our thoughts one day but enjoying a vibrant, colourful village community the next. For anyone looking for a Swiss Alpine escape in summer time it is ideal.